...Facemoods toolbar may change your homepage, search provider and tab to start.facemoods.com. If you prefer not to install this application, uncheck "Install Facemoods" when the 'Select Components' screen appears. The developer is not offering the portable (zip package) version anymore. Chips: MP3 Cutter has fewer features but a much smoother, approachable interface. 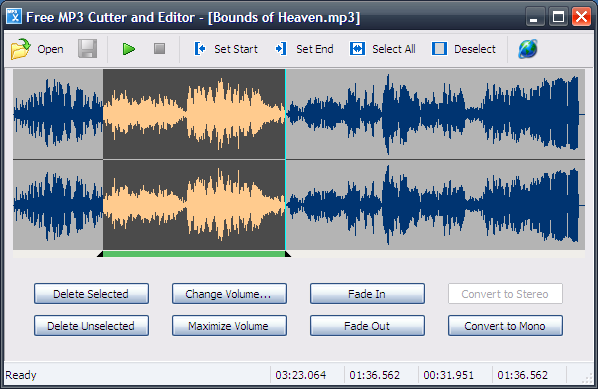 I think it still has a place in the database as a basic audio editor, where mp3DirectCut is for advanced users. hmmm.. sounds like mp3DirectCut is superior in almost every way, would it hurt to remove this entry? Ian: you're right -- I just verified that it upsamples. Updating entry. My comment got trimmed. MP3Direct Cut loads and saves almost instantly. MP3 Cutter took 20 seconds to load, 40+ seconds to save a cut, and upsampled to 128KBS. No option to change this, no position markers. Avoid the program for now. Numanoid is right. Worse, MP3 Cutter alters bitrate despite the claim that the quality is not changed. I tested with an 6.6MB OTR file encoded at 32kbs / 24000 Hz (a 28-minute Dragnet episode).